Dublin singer-songwriter Daniel Dempsey brings an authentic night of varying emotions to Liverpool’s Philharmonic Music Room, Getintothis’ Paddy Hoey reflects. 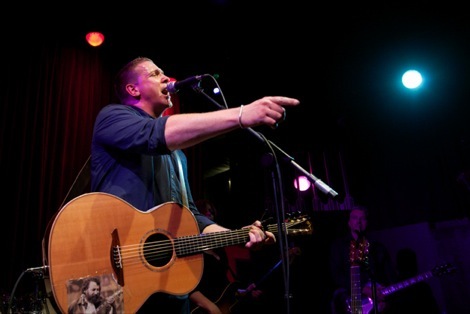 Damien Dempsey is a big, bruising boxer with the beautiful heart of a poet. He’s a modern bard who links the historic ballad tradition in Irish folk music to a youth culture equally at home with hip-hop, reggae and rave and a genuine one-of-a-kind: a sympathetic, ruggedly sentimental singer-songwriter who has managed to make folk music relevant again in an Ireland ravaged by the negative aspects of globalisation and corporate greed. It was fitting that he was ably supported by his great friend Ian Prowse, a singer-songwriter with an admirable amount of work under his penmanship, and who is also a decorated scholar of Irish history and culture. Browse Getintothis’ massive archive of gig reviews here! On a Sunday evening in October, Dempsey was the perfect closing act for the 2016 Liverpool Irish Festival. There were songs from his recent 1916 Easter Rising commemoration album, No Force on Earth, including the Euan McColl-influenced: The Island, James Connolly and Aunt Jenny which is about a family member who fought for freedom 100 years ago as well as some of Dempsey‘s greatest hits: Sing All Our Cares Away, Canadian Geese and Busting Out of Here. Folk music used to be about the hardships of the country or the coast and of people working in mines, on farms or fishing boats. Now the marginalised are the council estate working class shafted by banks and governments. The personal is always political with Dempsey and Almighty Love remains a beautiful testament to the women and men who have fought for equality globally. At the midpoint of the set there was a perfect encapsulation of the power of Dempsey’s unashamedly emotive music when the middle-aged couple in front of us cuddled during his bruised love song Hold Me. This sight had the potential to produce tears. Rest assured, the tears would come soon enough. As befits the boxer he was, Dempsey is capable of landing a perfect blow that can put you on your arse emotionally at any time, and when he threw in the anti-colonial rap Colony, there were tears in the house. He finished with songs that provided the very essence of his heart-tugging Celtic folk: the New York emigration song, Apple of My Eye, Shane MacGowan’s peerless Rainy Night in Soho, and Party On which might just be the best song ever written about the emotional effects of doing drugs. 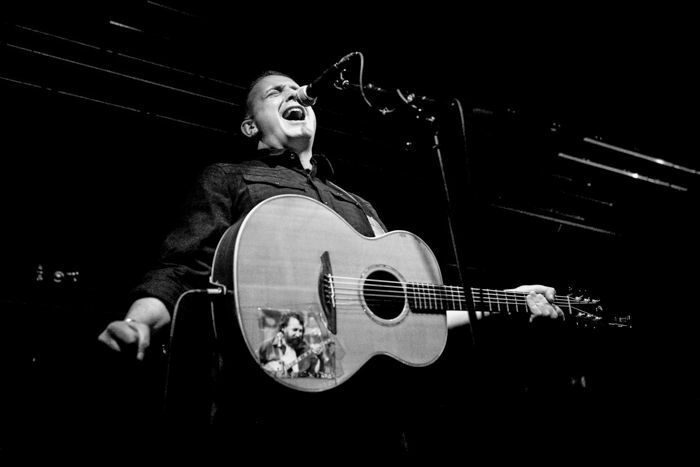 With an acoustic guitar, an authentic, evocative voice and a heart full of hope and compassion, Dempsey tugs the heartstrings in a way many others cannot.